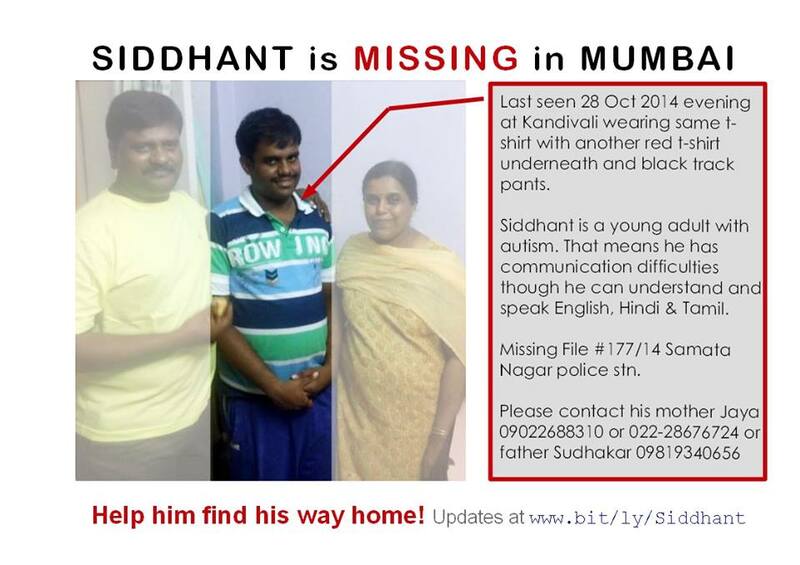 SOS – Help Siddhant find his way home! He has passed his 12th but has poor social skills. He speaks and understands English, Tamil and a bit of Hindi but has communication difficulties due to his disability. Siddhant is 19 years, 5 feet 4 inches and dark complexioned. In the attached photo, he is flanked by his parents. He was wearing the same Tshirt and another red one underneath, the sleeves of which peeped out from under, with black track pants, when he went missing. A Missing complaint filed at Samata Nagar police stn no 177/14. Please print and circulate this widely. AND HAVE ALOOK WHAT AUTHORITIES ARE DOING ? Ministry of Women & Child Development website National Tracking System for Missing and Vulnerable Children has STILL not put up info on missing Mumbai teen with autism – Siddhant Sudhakar. All details submitted more than 2 days back! Meanwhile Mumbai Police’s Missing People section is frozen in time since 16-10-2014. Mumbai Indians / mumbaikars – one of your own – a pioneer with autism is missing for 3 days now. 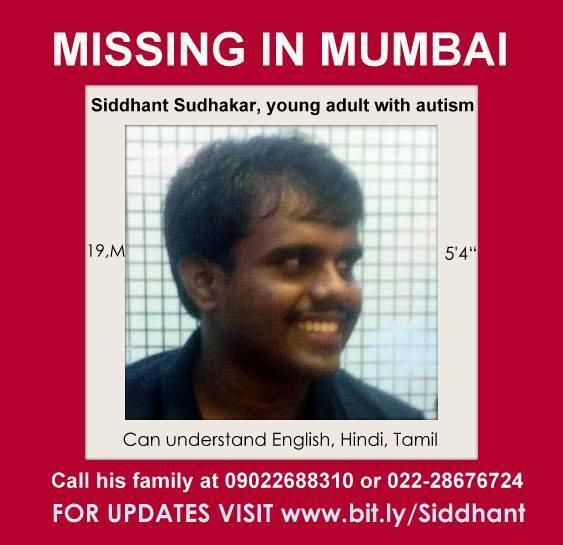 Help find him ASAP – get the word out on radio, Marathi & Hindi media, distribute flyers, contact NGO shelters – do what it takes for Siddhant’s sake! 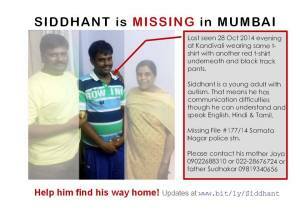 SIDDHANT HAS BEEN FOUND !!!! Thank you all for your love , prayers and support and THANK YOU GOD !!!!!! !